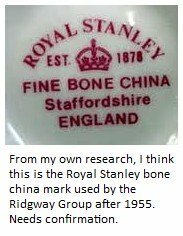 Royal Stanley is a backstamp of the Colclough Bone China Company (use the search box top right to locate their separate listing). 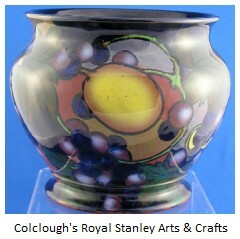 Stanley's 'Jacobean Ware' collection was produced by Colclough & Co from around 1903-1928. 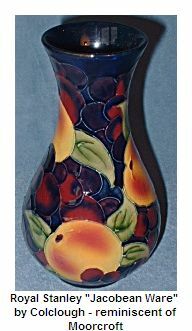 It was typically a terracotta body vase which owed much to the Arts & Crafts look of Moorcroft Pottery - (see Moorcroft Vases page). The Jacobean vases were often said to be 'poor man's Moorcroft'. The Stanley Jacobean ware is richly decorated and highly colourful with a high gloss and typically with rich Cobalt Blue Grounds creating a pretty and desirable desirable plate for display. Not in the same class as the eminent Moorcroft, but nowadays becoming increasingly hard to find and sought after by collectors of Staffordshire ware. For me they straddle the two adjoining eras of Art Nouveau and Art Deco. I can't make up my mind which era they rightly belong to. Today they are quite rare, and actually, to my eye, unusual and attractive. 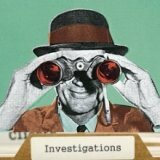 Prices at auction vary, but the as time goes on prices may well be seen to increase. Bargains are still to be had at the moment if you keep your eye out. The search also includes those sellers that don't put the word 'Jacobean' in their listing title. 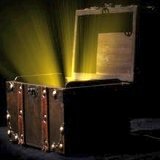 Some random 'Stanley' listings inevitably show up from time to time (it's a common word on eBay), but they are much fewer than the alternative keyword searches. I suspect there are a growing group of Staffordshire enthusiasts want to get some Royal Stanley Jacobean in their collection while prices are still reasonable. Ridgway Potteries Ltd bought out (or merged with) Colcloughs in 1955. The Ridgway Pottery listing can be found under 'R' in the antique bone china section. 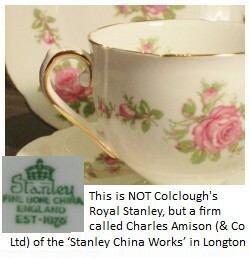 Colclough also used the 'Stanley' backstamp and sometimes 'Royal Stanley' mark for bone china production too. These vintage bone china items are of high quality, albeit mass produced, and often bone china cups and saucers of a similar design and shape to Colclough's own brand of bone china tableware can be found. Any Stanley items marked with the Ridgway pottery mark would be later than 1955. Collectors should beware there was another company not associated with Colcloughs in Godden's Encyclopaedia called "The Stanley Pottery Ltd" (Charles Amison & Co Ltd of the Stanley Works) also in Longton making wares between 1928 and 1939 who used a similar pottery mark. 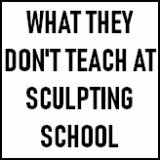 So don't get confused by the two different pottery marks. Amison's green marking shown in the photo dates from after 1953. Amison's Stanley continued until 1962, whereas, Colclough's Jacobean continued only until 1928 when there was a name change for 3 years, and all was silent as far as I know until the merger with Ridgways and the name seemed to be revived - but using bone china. 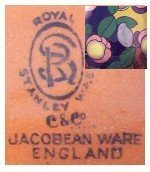 The date 1878 on the Royal Stanley pottery mark above is something of an anomaly as that date refers to the founding of the Amison company (Amison & Lawson 1878) - so why it is being used on the 'Royal' Stanley mark, can only be a matter for conjecture. I believe it is a product of the 1950's or 60's Ridgway group where, owning many old china brand names, they decided to amalgamate the two old Stanley firms into one. Or someone in their marketing department just got confused and didn't know there was already a Royal Stanley brand owned by the Group from the early part of the century (actually, an easy mistake to make really).